When our Lord and Master Jesus Christ said, “Repent” [Matt. 4:17], he willed the entire life of believers to be one of repentance. Among the many important letters Martin Luther wrote in his storied career, the one he wrote in protest of the sale of indulgences to Albrecht, Archbishop of Mainz, on October 31, 1517 might have been the most important. The letter itself isn’t the important part, but enclosed within it was a copy of his “Disputation of Martin Luther on the Power and Efficacy of Indulgences,” which came to be known as The 95 Theses. Now, scholars debate whether or not Luther actually took up a mallet to nail the theses up on Wittenburg’s Castle Church on that same day. Also up for debate is whether or not Luther actually intended to accomplish anything more than invite a scholarly debate between solid, Catholic theologians on an issue of importance. What is not up for debate is the colossal significance these theses had in instigating a theological and socio-political revolution that ripped open Europe, changing the face of Western, indeed global, Christianity to this day: the Protestant Reformation. 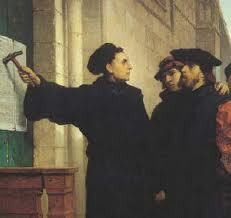 This is what Protestant churches celebrate on Reformation Day. Now, to be clear, we don’t mainly celebrate the politics, although a few good (and many bad) things followed. We certainly don’t sing about the tearing of the visible unity of the church. We don’t rejoice in the centuries of acrimonious disputes that followed. No, in fact, many of these are things we lament–at least we ought to. What we celebrate is the recovery of an essential insight into the Gospel: the good news that Jesus’ reign and rule are freely available to all, without regard to their present ‘righteousness’, or meritorious works; that we are saved by the grace and good will of our heavenly Father through the work of Jesus Christ; that we are justified, declared righteous because by faith we are united with the Righteous One, King Jesus. As it was later summarized in the 5 Solas: we are saved by grace alone, through faith alone, in Christ alone, according to the Scriptures alone, for God’s glory alone. Unfortunately many of us don’t know how to celebrate this Gospel properly. We sing, we praise, we write blogs about Martin Luther and the message of justification by faith, and in general have some nice, warm thoughts about the whole affair. Now this great news is certainly worth singing about; it’s definitely worth a blog or two. For these truths, unfortunately clouded over and muddied up however temporarily in the dominant, late-medieval theology of the day, to be regained and preached loudly and clearly for all to hear is a glorious thing. Still, if we want to celebrate Reformation Day properly, there is only one truly appropriate response: repentance. See, surprisingly enough for many Protestants, Martin Luther never mentioned the phrase “justification by faith” in the 95 theses. Not by name at least. He certainly spoke of grace and the nature of forgiveness, issues connected to it, but the subject he opened up with was the nature of repentance. For centuries Jerome’s mistranslation of Matthew 3:2 as “Do penance” instead of “repent”(as well as some other doctrinal developments) had led to a misunderstanding of Jesus’ call to respond to the Kingdom of God. The Greek term metanoia means a deep, internal change of mind–a reconsidering of one’s course of action in light of new realities. Luther saw that when Jesus called for people to repent, he wasn’t calling for a simple change of external actions, or for meritorious acts of penance, and certainly not for people to buy themselves some grace through indulgences. He was calling people to recognize the arrival of God’s reign and rule by turning and submitting themselves to it; it was an invitation to consciously live in the new reality of God’s kingdom made available by grace through Jesus. The Reformation was, in many ways, an attempt at this kind of repentance not only in the life of the individual Christian, but in the life of the Church as a whole. For those of us claiming the mantle of ‘Protestant’ there can be no question whether the whole of our lives need be one long process of reconsidering everything in light of the Gospel. Repentance is not simply a one-time act but a life-long task. Sin is too deep and Jesus is too good for us to think we ever have it handled–there will always be some sin our heart needs to release and some gift of God’s grace to embrace. God’s liberating reign in Christ is something we’re called to dive into daily. Pride – Consider God’s glorious humility in Christ and get over yourself–discover the joy of self-forgetfulness. In fact, try to practice humility by serving someone else without being able to take credit for it. Lust – Look to God’s beauty in Christ and realize He’s the summit of true desire. Gluttony – Take hold of God’s feast provided in the body and blood of Christ and pass the plate to those in need. Greed – Observe of God’s riches, his generosity in Christ and remember that God provides all we could ever want. Give generously to those who do not have. Sloth – See God’s active drawing near in Christ and respond–act–turn to him. Begin (or re-engage) in the spiritual disciplines that draw you to Christ. Wrath – Remember God’s putting away his own righteous wrath toward you in Christ and put away your own unrighteous rage towards others. Instead, be gracious in word and deed towards those around you–especially the aggravating ones. Envy – Recognize God’s gifts toward you in Christ and be grateful for what you have, not bitter what your neighbor has instead. These ought to keep you busy for a while. Now, start celebrating! I’m a Ph.D. student at Trinity Evangelical Divinity School attempting to study Systematic Theology. Adopted by the Triune God. Husband of McKenna. Former college pastor. Beyond that, I am an admitted cliche: books, beer, beard, and a blog that takes too much of my time. I'm a regular contributor to sites like The Gospel Coalition, Christ and Pop Culture, The Local Church, Mere Orthodoxy, and Christianity Today. I also co-host a podcast called Mere Fidelity. What Does the Text Say?